Contribute – Do You Write Reviews? Let’s hope they make enough money to warrant a sequel so we don’t have to see another origin story. It has been a few weeks, I’ve seen Man of Steel twice now, I’ve read several reviews on both sides, and now I’m going to throw my own thoughts out there to be picked apart by fans and flamers alike. An image from the movie “I Am Legend” which teased what could have been a possibile Batman/Superman team up. I am more of a Batman fan than Superman buff, but seeing as how Christopher Nolan was associated with this film, I had high hopes it would be successful. Past rumors suggested that when Superman Returns came out the year after Batman Begins, they were to put out a trilogy that would have a combined film for the third movie. I still submit that this would have been amazing had Superman Returns been halfway decent. It was not and Brandon Routh never got to share the screen with Christian Bale in what would have been a better movie than the Dark Knight Rises on any given day. But unless Superman can in fact change the rotation of the earth and turn back time to give DC the insight to reboot the story line instead of try to pick up where Christopher Reeve left off, we are stuck with the unfortunate decisions that have ruined the possibilities for a potential masterpiece. After seeing Man of Steel for the first time, I wasn’t surprised with the negative reviews from critics and fans. I credit this all to the confusing and dual story lines, the lack of character development and dialogue, and the shaky cinematography and flashy special effects. Man of Steel seems to be more like two stories in one and neither of them are given enough time or attention to be any good on their own. Seeing how Nolan served as the executive producer, the story was equivalent to Batman Begins and The Dark Knight compacted into one film with only 50% of the essential dialogue to keep the viewer informed as to where the story was going. Let me continue to make comparisons and point out the differences. Batman Begins is the origin story with a minor antagonist who helped shape Batman into a vigilante that villains feared and a hero that Gotham needed. It was simple, yet brilliant. Granted, if Man of Steel had tried to be that simple, there would have been just as many people complaining that it wasn’t as great as The Dark Knight, but it would have been comparable as an origin story. There wasn’t a single thing I appreciated about Kal-El’s origin story in Man of Steel. The whole Krypton segment felt like I was watching Green Lantern. Even Thor was better than the opening sequence of Man of Steel. Granted, I’m not a walking Superman encyclopedia, but it was hard for me to get invested in the back story of an advanced race that was living in caves, dressed in body armor, riding on flying walruses, and fertilizing their future race in open pools exposed to the elements. The rest of the origin story which is interspersed throughout the movie is stripped bare of any real developments that Clark Kent had to make in discovering he was Kal-El,. Snyder made so many changes to the original back story that the mythos of Superman was lost in a sad re-imagination. The other story line was not nearly as disappointing, but was disappointing all the same. The Dark Knight is all about how Batman is knocked off his pedestal by his greatest villain who turns out the be a product of protagonist himself. Likewise, Zod is Superman’s greatest rival and is drawn to Metropolis because of Superman. There are many great elements to how Zack Snyder interpreted the Kryptonian invasion of earth. Still, there were several key elements that I would have changed to make the story much better and more authentic. But seeing as how much I hated the origin story, I think this story line would have been passable if it stood on its own. The problems with this movie are clearly in the dual story lines that don’t work together, but what makes it even worse is the pitiful dialogue that comes across forced and sad. Even when they try to be funny and make a joke, the phrasing is just bland and colorless. If they were trying to speak down to the audience, they succeeded. Far from Alfred’s discourses and no where close to Ironman’s whit, Man of Steel could have had the whole script written on one page. If you saw the movie, and you left with a headache, it’s probably because of the shaky cinematography, fast paced graphics, and lens flares. I don’t know if Snyder was trying to imitate JJ Abrams or if he just thought what he was doing was really cool, but he went too far and it didn’t quite work. 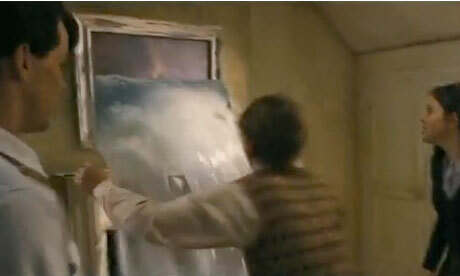 My final critique would be with my basic pet peeve of movie physics. While cars are being lifted off the ground and smashing back down due to a change of gravity, people are freely running around. Again, Lois Lane continues to fall from the sky while everything around her is being sucked into a black hole. Even Superman has a hard time flying against the forces. I could go on, but I’ll digress. I will say that Star Trek: Into Darkness had far more infractions to my pet peeves, but I didn’t mind because they did a much better job at developing characters, tension, and emotional connections. There are several elements that I really liked about Man of Steel. The cast is amazing. Henry Cavil makes a great Superman. Amy Adams is always beautiful, and the supporting cast was spot on. It was great to see Superman actually fighting with someone who could rival his own strength. I would have been happy to see the changes I mentioned before, but I’m looking forward to what changes they will make for the sequel. Without having to deal with the origin of Superman, they should have an opportunity to make a great story. Let’s hope that they listen to the vast majority of viewers who passionately love the mythos of Superman. With all the hating I just did, I would still give this film three out of five stars. If you have any interest in seeing Man of Steel, see it in theaters so that they will make enough money to warrant a sequel. Skyfall: Ode to the Past and the Promise of the Future. Nostalgia and excitement come together in the new Bond film, SkyFall. I recently had the chance to take some much needed time off from my very busy schedule and watch the newest James Bond film in theaters. 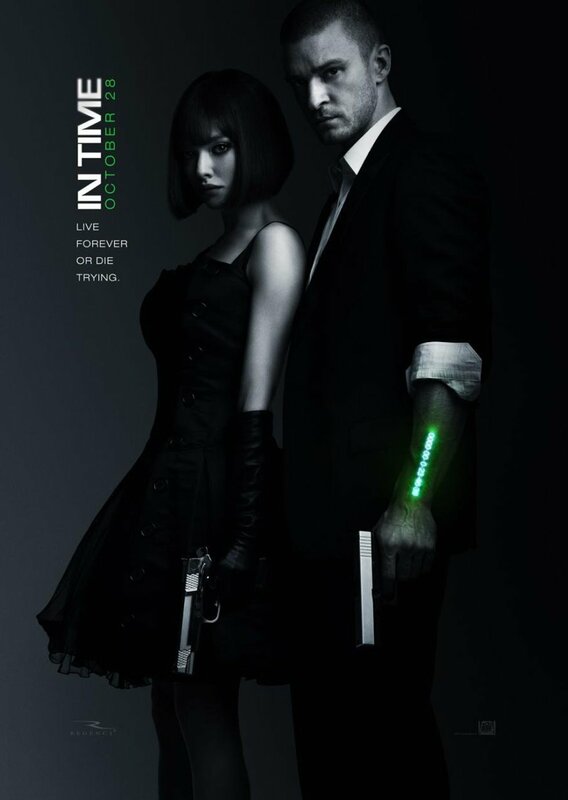 I was pleasantly entertained by the fast paced action, the clever dialogue, and the classy style that is nostalgic to the 007 persona. I wouldn’t go so far as to fully endorse the movie for everyone else, but it does present for me a remarkable example for how to be fresh and contemporary with a new and exciting story meanwhile not straying too far from the formulaic nature that has made it a success for generations. Daniel Craig is clearly the singular defining attribute that has made this new series a success. I remember years ago the confusion I felt in selecting Craig as the 007 replacement. I couldn’t quite imagine then how that would work out. Yet, reflection has confirmed that this was the best decision the producers of the Bond series have made in decades. Craig commands the screen and possesses all of the class and charm that James Bond represents, while maintaining an extremely tough exterior and a complexity of inner turmoil. Apart from the silly way he runs in this film (which elicited laughs from the audience) and the awkward looking duck-face he kept making in Casino Royale, Daniel Craig has endeared himself as the Bond for a new era. However, an actor is only as strong as the story he finds himself in. Craig captured our hearts and memories with his debut in the intricate story of Casino Royale. Yet, even his best acting could not redeem Quantum’s awful script. Both films took different routes. Casino Royale paved a new path that threw conventionality to the wind, while Quantum of Solace took a formulaic stroll, emulating past successes. With Skyfall, it seems the writers got it right by applying the perfect mix of nostalgia while paving a new direction for their lead character. This leads me into the point I would like to make about how to write a successful story, and satisfy the conventionality of lifelong fans. Many directors and producers don’t have a clue about what makes their films successful. Too often they depend on the formulas which have worked in the past when writing sequels. But viewers don’t want to see the same story year after year with revolving characters. What Skyfall did right was absolutely evident. Starting with a fresh story, the writers were able to add in key elements from the past to provoke nostalgia for classic fans and add nuance for first time viewers. Giving Judi Dench her swan song, bringing back the iconic Aston Martin, and showing more of James Bond’s back story all worked together perfectly to give Skyfall it’s own two legs to stand on. There was an impressive amount of detail in the more than two hour run time. All of the class and gravitas you expect from a 007 production was there, and more. However, it wouldn’t be a fair and honest critique if I didn’t point out some of the things that didn’t work in the film as well. The Bond girls were merely background pieces and didn’t add much at all to the thrust of the story. Their character development seemed forced and underdeveloped. The villain, played by Javier Bardem, was a mix of past archetypes and wasn’t quite scary enough to give the full weight of suspense needed to be a believable antagonist. Finally, while the writers were cautious not to copy the same formula of past Bond films, they clearly had no problem stealing other elements from successful actions films in the past decade such as The Bourne Identity, The Dark Knight Rises and Mission: Impossible IV. What I love about this film is the fact that it took risks. Daniel Craig is not exactly the Bond we knew from the past, but he is clearly talented enough to carry the series into the future. Let’s just hope that the writers and producers keep taking chances while remaining close to the characteristics we have grown to love. Skyfall will undoubtedly stand as the example of how to do a successful film which bounced back from a failed attempt to repeat the past. Although I wouldn’t rate it anywhere near Casino Royale, it clearly survived the dead weight it had to carry from Quantum of Solace. While most Bond fanatics won’t have to be convinced to go and watch this film, others might find it surprisingly entertaining. The other day I got to go see the movie ‘In Time’ (Starring Justin Timberlake and Amanda Seyfried) when my girlfriend and her roommate came out to visit me on the Cape. While they were pleasantly amused by the simple storyline with the hottest young actors in Hollywood today, I was less than enthralled by yet another spin off of a classic story. Imagine a world where time literally is money. Once you turn 25 you stop aging, but now you have to start earning time just to stay alive. A cup of coffee will cost you four hours while a night at a hotel will cost you a month. In this world, living from paycheck to paycheck means you wake up every morning with just enough time to make it through the day. In this story JT plays a rags to riches character much like Aladdin who ends up robbing the rich to give to the poor much like Robbin Hood. Apart from a crash scene that will literally make you laugh with how awful the special affects are and the incessant amount of cliches about time, the pace of the film wasn’t that bad. And since the premise is built on the fact that nobody ages over 25, the cast is full of Hollywood’s hottest young actors (Matt Bomer, Olivia Wilde, Alex Pettyfer), though some were hard to image they were only 25 (Cillian Murphy, Johnny Galecki). The only thing that would have made this film more comical was if the cut off was at 12 or 16 years of age and starring Jonah Hill and Michael Cera. While the ending will appeal to the average audience for not taking any risks by rewriting the classics, it didn’t carry enough impact to warrant a good review. I give this film 3 out of 5 stars for being a 109 minute long cliche. Awards season is upon us and all of us at ROTB are working on seeing the films in consideration. This is a bit tedious as some of the films nominated are only limited releases and thus, difficult to see before they are released on DVD. This year has been better than most though, as some great films have been bumped up into wide release categories to get more attention. Hopefully many of you were able to catch films like The Kings Speech, True Grit, The Fighter and Black Swan. We are going to be reviewing all of those films in the next few weeks so keep tuned in. Also, we here at ROTB will be making our Oscar picks and predictions the week before the ceremony (Feb 20-27). 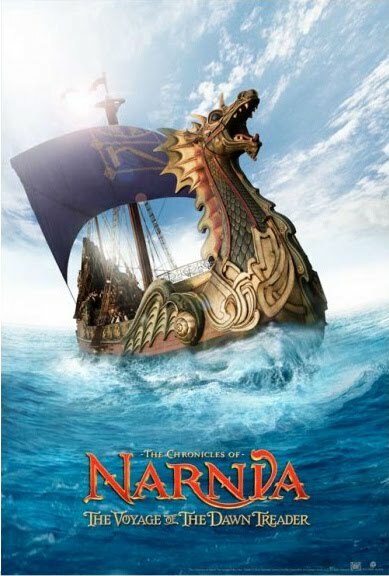 The Chronicles of Narnia: The Voyage of the Dawn Treader, taking the cake as the longest running title in theaters now, is also leading in the box office numbers due to it’s familiar family centered material and the fact that it’s showing in 3D, but projections probably won’t last as The Fighter, Black Swan, and Tron Legacy go nationwide. 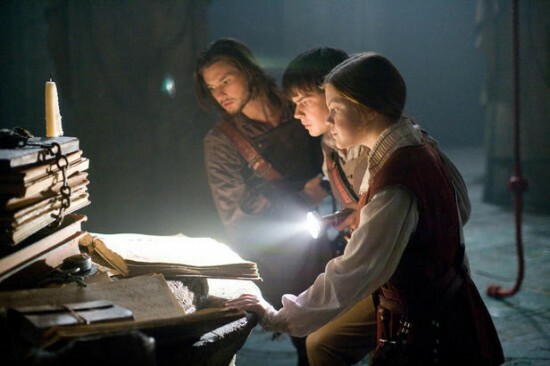 The Dawn Treader chronicles the third installment of the C.S. Lewis inspired story of Lucy (Georgie Henley) and Edmond (Skandar Keynes) Pevensie’s final adventure in one of the most imaginative worlds ever created in classic literature. This adventure, however, they’re not alone as Eustace Scrubb (William Poulter) their logically driven and disbelieving cousin is dragged into their mystical kingdom through a painting which comes to life. The adventures and lessons the trio learn along the way are rich and exciting. 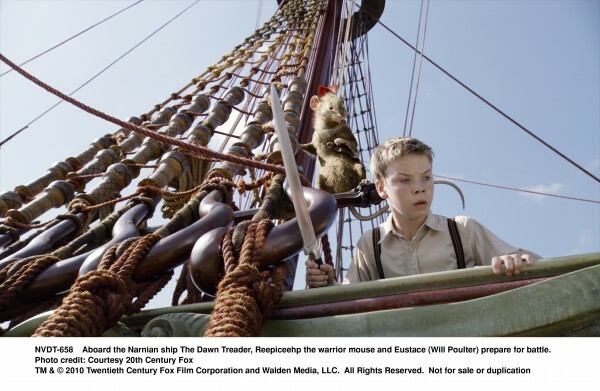 Caspian (Ben Barnes) and Reepicheep (Simon Pegg) join in on the journey as the crew of the Dawn Treader search for the missing lords and a mystical green mist that is causing people to go missing. 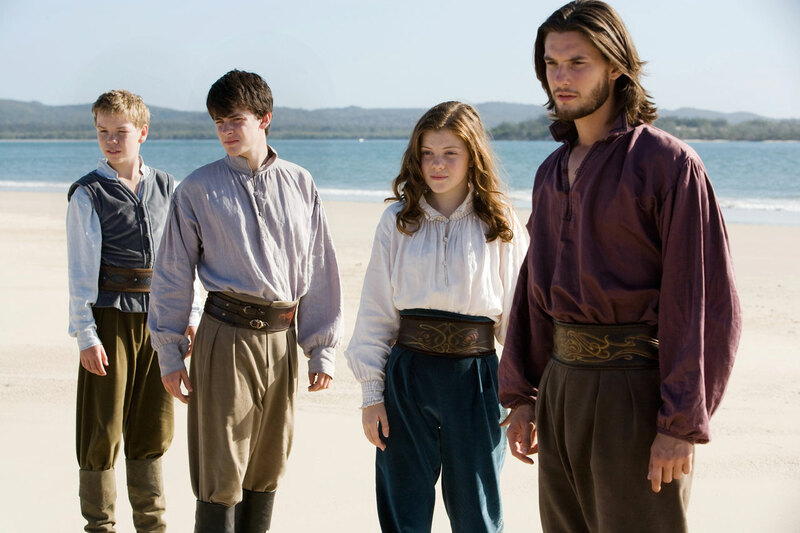 Each situation is true to the original story and will be refreshing to fans who were disappointed with Prince Caspian. This film gets it right. While the narrative is obviously rich, it’s one of the best stories in the series, the pacing of the movie has a hard time pulling off visually what C.S. Lewis was able to do with the written word. Each chapter of the story leaves you on the edge of intrigue, pressing you to read on. The movie has a few dry spots, and I’ll admit I dosed off for a few moments. But not a lot can be done in the transition from book to screen when the book contains so many rich details. Only Peter Jackson can pull off a miracle like that and he needs six hours. For fans of the series, this will bring back all the memories of the first time the story came to life in your imagination. Those who haven’t read the story may not be able to connect with the richness and depth. The visuals are stunning and eye popping. Apart from a few shots where the set up looked like a made for TV movie this film definitely exceeds the visual efforts of the previous two installments. I saw it 3D and I can assure everyone that ‘s not worth the extra few dollars. The best qualities of this film are in the characters and the thrills of the story. While using the original cast with Georgie Henley and Skandar Keynes as the leads, it was really William Poulter who stole the screen as the annoy ing yet endearing Eustace. Poulter hits every note right and really proves his depth as a young actor. 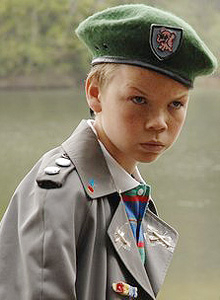 His freshman role in Son of Rambow caught the world’s eye and honestly, there was no other choice for this movie. Keep your eye on Poulter and you’ll be able to see a relative nobody rise from nothing to the highest ranks or Hollywood. I give this film 4 out of 5 stars. I wouldn’t recommended it for people who aren’t already fans of the story. This film is in theaters now.